It’s a common expression, that one where we roll our eyes, look exasperated, and say, “It’s not a matter of life and death!”. But I’ll try never to use that expression again. Life IS a matter of life, then death. That’s not morbid. It’s just how it is. And none of us know what the next moment will bring. Ever. But, and here’s the big BUT, because of the fact that we do die, we have an opportunity to choose to live fully in the moment. Now. We can’t really just put things off until tomorrow, because … well, you know the rest. And do I live this way? No, have to confess that I do not. Well, sometimes, but not routinely. This past Mother’s Day weekend I had a long phone conversation with my Wisconsin daughter, Jenelle, about living truthfully, facing loss and change, and being in the moment. She shared with me a song that her friend Allegra wrote called Carpe Diem , and we talked a bit about letting go. It was one of those philosophical conversations that was intense and meaningful, and one that I chalked up as a contribution to a really good day. And then I spent the afternoon pulling weeds in the flower bed and making plans for a sculpture for the art festival. Ordinary stuff. Good stuff. But circumstances didn’t let this topic sit idle for long, as just after our conversation, Jenelle found out that her neighbor’s 18 year old son (and the brother of our grandson’s best friend) was killed in a car accident. Life. Death. Everyday days. Sleeping. Dreaming. Loving. Celebrating. Letting go. Grief. Joy. Laughter. Tears. Dancing. Crying. Wailing. Hugging. Wondering. Doing. Choosing. Accepting. Denying. Feeling. Being. Since we really don’t know at the time which of our actions or conversations or non-actions are the ones that matter, perhaps the wise way is to live as if they all matter. And I suspect that they do. But, since we can’t do everything that we imagine, or be everywhere that we’d like to be, how DO we choose our path? And choose we must or we risk becoming paralyzed and doomed to watching our life diminish before our eyes. I don’t do these things perfectly, either. But I rest more comfortably with this imperfection when I read Don Luis’s wise words about doing our best at all times. He says that our best is not a black and white thing that can be judged from outside of ourselves. It changes given the circumstances. It isn’t a rigid thing. What’s important is to be honest with ourselves in the moment, and act based on conscious choice. I can’t find my copy of the book right now, but feels to me that there might be words in there about forgiveness and love and letting go as well. Have to get on with my day. Have lots of things I want, and need, to do. But first I think I’ll go back and read Allegra’s blog and words to her song again until I get it. Really get it. I love it when people surprise me with their wit and humor, curiosity and imagination. My friend Dawn-Marie Quinche does that quite often, as witnessed by her take on the ordinary rhubarb plant. 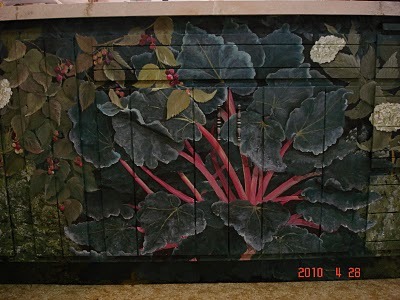 Dawn-Marie has been painting her kitchen cupboards, and what better image to put over the door to her compost bucket than the lovely rhubarb plant? What better image, indeed. Brings back memories of those long-ago days when my sister and I would pick rhubarb to take in to our mom, then would use the discarded leaves to make lovely skirts and hats. They were sooooooo BIG. My romantic, nostalgic reaction to rhubarb is much different from my husband, Dan’s, who thinks rhubarb is best left in the garden all together. But me? I love Dawn-Marie’s rendering and the gentle way it takes me on a walk along that inner garden path of memory. For a treat with words, click on the link to Dawn-Marie’s blog, and scroll down to the April 29 post to see what she has to say about Robert Frost’s Poem, “The Road Less Traveled”. Made me smile! And how about the earlier post about the rabbit being painted near the … ( I won’t give that part away. You’ll have to click to read it! ).